Flan, also known as créme caramel, is a rich custard dessert cooked with a layer of caramel on the bottom of the baking dish or ramekins. When the custard is chilled, then flipped onto a plate, the caramel forms a sweet liquid topping. You don't need an oven to bake this silky, creamy Instant Pot flan. The scrumptious dessert cooks in less than 10 minutes in a 6-quart or 8-quart Instant Pot. Make the flan at least 4 hours before you plan to serve it. The flan should be cooled to room temperature and then refrigerated for at least 3 to 4 hours. Arrange six 5- or 6-ounce ramekins on your work surface. Add 3/4 cup of sugar and 1/4 cup of water to a saucepan and place it over medium heat. Cook, gently swirling the pan, until the sugar is melted and golden brown. Working quickly while the syrup is still liquid, add about 1 tablespoon to each ramekin, swirling to coat the bottom. Repeat with the remaining sugar syrup and ramekins. Set the ramekins aside while you prepare the custard mixture. In a mixing bowl, whisk the eggs and egg yolk with 1/3 cup of granulated sugar and a dash of salt. Combine the milk and cream in a medium saucepan. Place the saucepan over medium heat and cook until the milk mixture begins to bubble around the edge. Gradually whisk the hot milk and cream mixture into the egg mixture. Add the vanilla extract and whisk to blend thoroughly. Divide the custard among the ramekins. Cover each ramekin tightly with foil. Place a trivet in the Instant Pot and add 1 1/2 cups of water. Arrange the ramekins in the pot, stacking as necessary. Lock the Instant Pot lid in place and turn the steam vent to the sealing position. Set the pot to manual or "pressure cook" setting, high pressure, for 9 minutes. When the time is up, let the pressure release naturally for 15 minutes. Carefully turn the steam release vent to the venting position to release the remaining pressure. Remove the ramekins to a rack to cool to room temperature. Refrigerate the individual flan desserts for 3 to 4 hours, or overnight. Remove the foil from the ramekins and let them stand at room temperature for 10 minutes. Carefully run a thin butter knife around the edge to loosen the custard. Un-mold onto rimmed dessert plates. If the flan doesn't un-mold immediately, tilt the ramekin from side to side to break the vacuum. After the flans are unmolded, set the ramekins in a pan with about 1/2-inch of hot water to melt some of the remaining hard caramel in the bottom; spoon or drizzle the extra caramel over the flans. Before you begin to prepare the flan, make sure your ramekins will fit on the trivet in the Instant Pot. If they are larger, it might be possible to place another trivet on the first layer of ramekins and set the remaining ramekins on that trivet. Just make sure they don't interfere with the lid. If a baking dish, ramekin, or even teacup is oven-safe, it can be used in the Instant Pot. 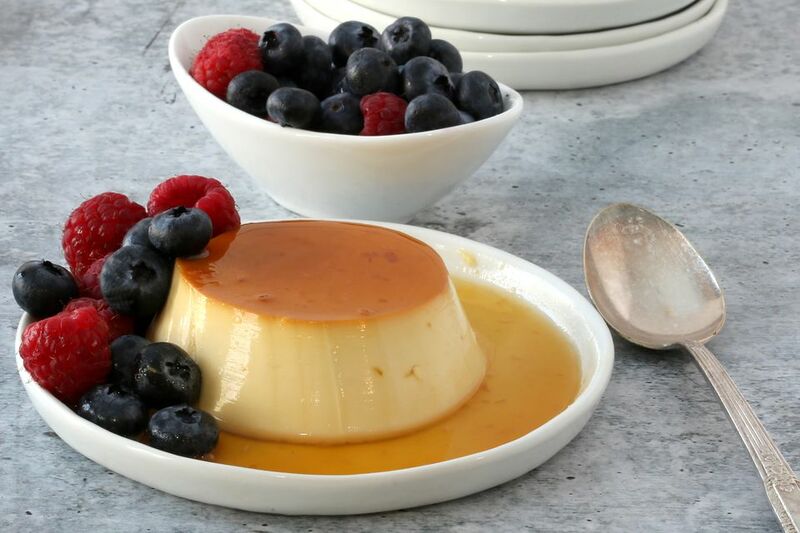 Flan for eight: Divide the caramel and custard among eight 4-ounce ramekins. One Pan Flan: Pour all of the caramel into a 6-inch soufflé dish or 7-inch round pan. Add the custard and cook at high pressure for 15 minutes. Let the pressure release naturally for 10 minutes; carefully move the steam release vent to the venting position to release the remaining pressure, and follow remaining steps.